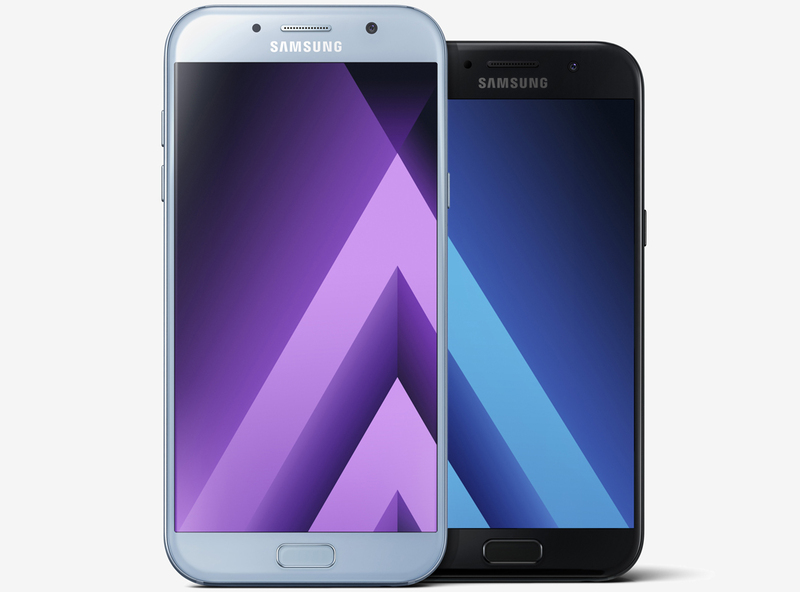 Samsung on Monday unveiled a trio of new Galaxy A series smartphones that more or less mirror the company’s flagship devices in terms of styling but at a more affordable price point. The new Galaxy A7, the high-end model of the bunch, features a 5.7-inch Full HD Super AMOLED display powered by a 1.9GHz octa-core CPU and 3GB of RAM. Other creature comforts include 32GB of local storage (expandable via microSD card slot up to 256GB), 16-megapixel cameras on the front and rear, 802.11 a/b/g/n/ac Wi-Fi, Bluetooth 4.2 and USB Type-C connectivity. The A7 carries an IP68 rating, packs a 3,600mAh battery with Fast Charging capabilities and runs Android 6.0 out of the box. The Galaxy A5, meanwhile, checks in with a slightly smaller 5.2-inch FHD Super AMOLED display and is also powered by a 1.9GHz octa-core chip and 3GB of RAM with 32GB of local flash storage on tap (also expandable via microSD card slot). The A5 also has dual 16-megapixel cameras, 802.11 a/b/g/n/ac Wi-Fi, Bluetooth 4.2 and USB Type-C connectivity. Its battery is a bit smaller at just 3,000mAh but will also include Android 6.0 Marshmallow pre-installed and carries an IP68 rating. Moving down the ladder to the Galaxy A3 affords a 4.7-inch 720p Super AMOLED display, a slower 1.6GHz octa-core processor and just 2GB of RAM. Local storage is also cut in half with just 16GB on hand although you can once again expand it via microSD card slot. The A3 utilizes a 13-megapixel rear camera and an 8-megapixel front-facing shooter, 802.11 a/b/g/n/ac Wi-Fi, Bluetooth 4.2 and USB Type-C connectivity. The battery here is even smaller at 2,350mAh and Samsung makes no mention of Fast Charging capabilities. Android 6.0 Marshmallow again draws the assignment. Samsung says the new Galaxy A smartphones will be available in Russia in early January before expanding to global markets. Pricing remains a mystery as of writing but with any luck, we’ll get more details as CES 2017 week plays out.